Legalizing marijuana for recreational use in California would raise an array of unknowns, from how it would be taxed to the threat of environmental damage from thirsty pot plants in a state gripped by drought, a commission was told this week. As activists move to bring a proposal legalizing pot use to voters in 2016, the panel headed by Lt. Gov. Gavin Newsom began considering how a state of 39 million people would change with once-outlawed pot consumption becoming a legal, and potentially widespread, practice. What was clear is no one knows. Even Newsom, a Democratic candidate for governor in 2018 who supports legalization, acknowledged he has concerns. The former San Francisco mayor is aligning himself with an issue that polls show has gained growing acceptance in the state, but promoting the loosening of marijuana laws also comes with inevitable political risks for a future campaign. Newsom told the group it was time for the state to move in a new direction, lamenting a drug war that had fallen short of its goals. At other points, he worried about a black market that could bloom if taxes drive buyers underground and the safety of children, including his own. He worried about advertising and its effect of youngsters, and the spread of availability. Activists have been promising to qualify a ballot proposal for 2016 that, if enacted, would legalize recreational use, following Colorado, Washington state, Oregon and Alaska. 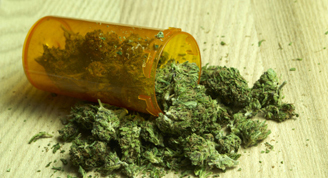 Medical marijuana is legal in California and more than 20 other states. The drug remains illegal under federal law. Among California Democrats, positions are mixed. Gov. Jerry Brown opposes legalization. For candidate Newsom, “he has to be aware of the inevitable downside of legalization,” said Claremont McKenna College political scientist Jack Pitney, alluding to the potential for higher crime, car accidents or health issues that could come with broader use. “Even though polls show there is increasing support for legalization, there is still a lot of resistance, particularly among older voters. And older voters make up a disproportionate share of the electorate,” Pitney added. The panel, brought together by the American Civil Liberties Union of Northern California, heard from a string of public safety advocates who warned of potential fallout from the courtroom to backcountry pot fields. Paul Gallegos, a former district attorney in the marijuana-growing heartland of Humboldt County, noted that a pot plant needs 6 gallons of water each day over its 150-day growing cycle. Ventura Police Chief Ken Corney told the panel that science has not devised a way to quickly and accurately measure marijuana intoxication, similar to the tests used for alcohol. Kristin Nevedal of Americans for Safe Access called for more accurate labeling of potency, which she said can vary significantly in certain products. “This is complicated,” Newsom said at one point.